Dominic Green’s 27-foot shot at the buzzer stunned No. 9 Arizona and thrilled a sellout Hec Ed crowd, which embraced the return of Lorenzo Romar, then helped thwart him. A little before tip-off, when Lorenzo Romar walked onto the Hec Ed court as an assistant coach for Arizona, the Washington crowd gave him a roaring ovation. What could have been awkward was sublime. When he left the court after the Huskies’ 78-75 win in as spectacular a single, buzzer-beating moment as the program has had, again it could have been awkward. After all, coach Mike Hopkins took over Romar’s seemingly comatose program and his players and rocked him with them, in a seismic sort of way that seemed a momentary threat to the old barn. But the guess is here that Romar is OK, mostly because of what Hopkins told him when the two met before the game. That one day came Saturday night. All the purples could not have been more proud. Hopkins has turned around Washington hoops so fast he’s left skid marks on the space-time continuum. He did it with a starting lineup that included four holdovers from Romar’s final team that lost its last 13 games, plus a freshman recruit that was the only one left from a stellar five-player class that abandoned Washington when Romar was canned. As much as mind-bending irony of losing a 14th game in a row involving the Huskies may have hurt, Romar has to proud of his guys doing so well, and as an alum, can’t help but be amazed at what Hopkins has accomplished. Against a program so loaded with talent that the FBI is charging it with crimes, Hopkins crafted a preposterous plan: Take the ball inside against seven-foot senior Dusan Ristic and 7-foot-1 freshman Deandre Ayton, the latter perhaps the next NBA draft’s No.1 pick. Preposterous, because the only big guy UW has who can shoot is junior Noah Dickerson, who’s 6-foot-8, maybe. The plan was hoops suicide. Somehow, Dickerson got off for 25 points (10 of 16 shooting) and seven rebounds. Even more amazingly, he had just two personal fouls. Joking before the game on press row, I predicted that Dickerson would have two fouls on him before the national anthem was over. Missed that one by a light year or so. I presumed that the college hoops world’s crankiest man, Sean Miller, and his haughty, ninth-ranked Wildcats, would weather an early adrenaline storm from the Huskies and wear down the overmatched Montlakers late for a 10-point win. But Washington (17-6, 7-3) so carefully managed its game that Arizona (19-5, 9-2) never led until seven minutes remained, never built more than a three-point edge. In the end, the three-point edge was the difference for Washington — 8 for 14 against Arizona’s 2 for 12. The Huskies’ final one will be replayed on national TV college highlight shows until Bill Walton runs out of words. Tied at 73 as the clock drifted into the final seconds while 10,000 screamed violently, the UW’s rookie and leading scorer, Jaylen Nowell, had the ball up top and then headed hoopward, as he has done several times this season with the game on the line. His 10-foot runner was blasted almost 20 feet by Ayton, a stupendous athlete that Hopkins later claimed can touch the top of the backboard. The game seemed destined for overtime until the realization struck that 6-6 junior forward Dominic Green was standing so close to the sideline that he seemed a part of the Huskies bench. The rejection came to him on a single bounce. He calmly gathered himself just inside the boundary and launched from 27 feet a high three-ball with a perfect parabola. It ended Arizona’s seven-game winning streak and the last pretense that the Huskies were not for real. It completed a home sweep of the Arizona schools, having beaten 25th-ranked Arizona State Thursday, and compelled Hopkins to talk more about Romar’s players. “He recruited these guys,” he said. “When we were going through (the transition between staffs), he talked to a lot of these guys about staying (at Washington) and believing in the staff. 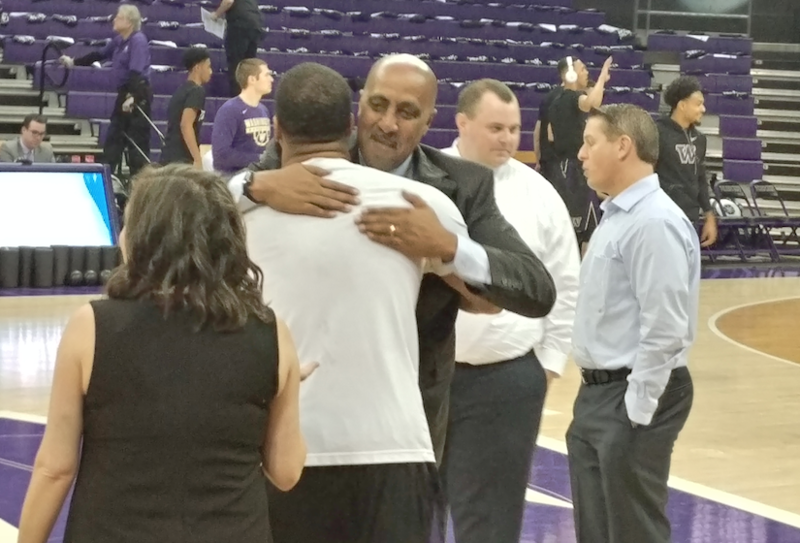 As hundreds of fans rushed the court to celebrate, Romar in the handshake line offered hugs to his former players. After the game, the players’ response was simple. They stayed at Washington, only to help see him lose again. Hard to know whether the irony or the win was more improbable. Who needs the NBA??? THIS is what sports are all about – a sellout crowd, student section going wild, team plays hard all game, three at the buzzer to beat a VERY good team, new coach vs old coach, etc. At this rate, Hop will OWN Seattle hoops and if people are smart, they will buy season tickets NOW, before they are all sold out forever. Oh, and great coverage Art! One of greatest college games I’ve seen. As I tweeted, Balboa-Drago, Part Deux. You took the words right out of my mouth Art , that was one of the best college games I’ve ever seen ! Dickerson man , that guy is playing fantastic lately ! So nice to see some play in the low post . Even Timmons hit a couple of buckets . Surely they go dancing now , barring utter collapse from here out .. I have tickets for the Colorado game in 2 weeks . And I’ve already looked at going to Vegas for the tourney ; I’m thinking about it . Man this is a fun ride ! Coach Hopkins has to be considered for Coach of the Year . Thanks for saying Hec Ed. Just a great game. Dickerson and Thybull…immense improvement. A far cry from the thankfully shorty days when Seattle had a different coach named Hopkins. Of course, that eventually worked out pretty well, too.